Indonesia's President Joko Widodo, left, and Chinese President Xi Jinping shake hands as they attend the welcome ceremony at Yanqi Lake during the Belt and Road Forum, in Beijing, Monday, May 15, 2017. How Can Indonesia Take Advantage of the Belt and Road's Opportunities? The BRI is a double-edged sword, how can Indonesia take advantage of the benefits and avoid the pitfalls? 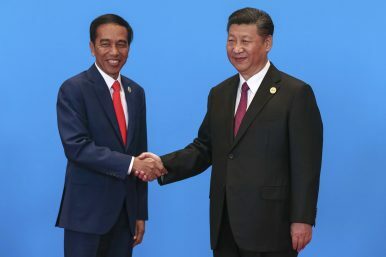 There have been reports stating that China’s trade and investments in Indonesia have grown and expanded noticeably since the initiation of the Belt and Road Initiative (BRI) in 2013. The BRI, which focuses on infrastructure projects as a reconstruction of the old Silk Road across Asia, Africa, and Europe, has led to expanding Chinese footholds worldwide. To date more than 60 countries — accounting for two-thirds of the world’s population — have signed on to BRI projects or indicated interest in doing so. From the start of the BRI in 2013 to 2018, approximately $460 billion has been invested in initiative-related projects. By January, the value of new BRI projects added up to $4.5 billion, with majority being invested in sub-Saharan Africa. On the other hand, last year trade gains originating from the BRI stood around $158 billion, with ASEAN countries, Russia, and South Korea as the biggest beneficiaries. As explained below, Indonesia is surely not an exception in experiencing the expansion of China’s economic presence since the launch of the BRI. However, there are both opportunities and threats that Indonesia needs to acknowledge and deal with in order to benefit fully from the initiative. While China previously was not among Indonesia’s top five FDI sources, the BRI has made China the third highest investor in the country, with $2.3 billion covering 1,562 projects. Such increasing figures are accompanied by around 1,000 Chinese companies and 25,000 Chinese workers present in Indonesia. Growing Chinese investment in Indonesia could be both an opportunity and a threat. Investments are the wheels of economic growth and development. Indonesia requires foreign investments to finance the current account deficit and to generate economic growth. FDI is expected to be the main source of economic growth, in addition to the government’s budget for infrastructure. Chinese investments under the BRI, which include the construction of airports in Sulawesi and the Jakarta-Bandung high-speed railway, could not only contribute in Indonesia’s efforts to solve its current account deficit, but also help develop its infrastructure. This, in turn, could help enhance economic growth by creating good infrastructure, which improves connectivity and reduces transportation and logistical costs. However, such investments also present threats to Indonesia. Besides being too focused on the infrastructure sector, the massive flow of Chinese workers could be an issue. While bringing its own workers is the norm for Chinese firms, workers from China could be a threat to Indonesia’s employment trends. Moreover, in recent years, there have been reports concerning a noticeable number of illegal Chinese workers in the country. The same also goes with trade. It was reported in 2018 that China’s trade with the archipelago reached $72.6 billion, a 23.5 percent rise from the previous year. This growth rate was a tiny decrease from 2017 where it experienced growth of 23.7 percent. While Chinese imports to Indonesia mainly constitute high value-added goods and high-tech items such as electronics and machinery, Indonesia’s exports remain resource-based commodities such as coal and crude palm oil (CPO). Although Indonesian CPO is banned from several countries due to a campaign in Europe and tariff barriers in India, China decided to increase its imports from Indonesia last year. This decision saved Indonesia, as the commodity is one of its engines of growth. In total, Indonesia’s non-oil exports grew by 14.27 percent in 2018 compared to the previous year. Despite the growing figures, there is also an enigma: Indonesia is facing a trade deficit. The non-oil and gas trade deficit from China has increased from $8.25 billion in 2013 to $18.98 billion in 2018. Other trade partners like Japan only recorded a deficit of $2.01 billion in 2018, and this deficit decreased compared to five years ago. For trade, the BRI can be a double-edged sword. Likewise, the infrastructure that is currently being built via this initiative could have both favorable and unfavorable consequences. As China’s economic activities in Indonesia will grow in the coming years, it is important for Jakarta to make efforts to ensure that it can reap opportunities from the development. There is a need on the part of Indonesia to learn about opportunities that it can take from China’s expansion all over the world. For example, in recent years, China has increasingly been interested in Islamic finance and halal industries. While this growing interest has been garnered by the Gulf countries, Indonesia, as the country with the largest Muslim population in the world, should be able to seize an opportunity here. Another opportunity comes from China’s recent moves to slow coal imports from Australia. While Indonesia has been exporting coal to China, the government in Jakarta must take innovative steps to fill the supply gap resulting from Beijing’s recent move away from Canberra. Indonesia also needs to take advantage of China’s market, which is now the world’s biggest. It should not be enough simply to export raw commodities to China. Indonesia should make an effort to build up downstream industries and provide final goods to China’s market. Indonesia could start with its food and beverages industry, which is growing and in high demand in China. It is also crucial to encourage China to invest in sectors beyond infrastructure. One example is Chinese FDI in the Australian dairy sector, which has helped the industry to grow and become able to export their products to China. Indonesia could do the same by, for example, promoting its crop and fishery industries to China. Indonesia also needs to revise its regulations concerning foreign workers. This is to ensure that Indonesian workers still benefit from this phenomena, and to avoid the entry of illegal workers into the country. Qatar is a good example in this regard, where it still requires foreign firms to hire locals, especially in managerial and directive positions. The writers are researchers at the Institute for Development of Economics and Finance (INDEF). Is China’s Belt and Road Initiative an Opportunity for Indonesian Renewable Energy? Is there a significant role for BRI to play in the Indonesian renewable energy sector? Winning Hearts on China’s Belt and RoadChina and Indonesia: Joint Cyber War SimulationsChinese Culture Gradually Penetrates IndonesiaIt’s Time for a New Philippine Strategy Toward ChinaWill Foreign Policy Matter in Indonesia’s Presidential Election?